The exact number of Wise Men is not known but since the Bible talks of three gifts that were presented, it is assumed there must have been three Wise Men, each bearing his own gift. Another unknown fact is the time of arrival of the Wise Men to Bethlehem. Traditionally, Christmas cards and book illustrations show Jesus still lying in a manger when the Wise Men came to visit Him. But Jesus could have been a few days up to two years in age. No matter what age he was, Jesus was recognized by these men as someone the world had been waiting to arrive on earth. He was an answer from Heaven to every trouble of mankind. Truly, these men were very, very wise. So, in their wisdom, they brought Jesus gifts, three in number, a very important number at that. In Biblical “mathematics”, the number three is the number of divine completeness, of perfection. Three is known as the “Divine Number”. When on earth, Jesus represented the three divine entities of the Godhead: Father, Son, and the Holy Spirit. Three times a voice from heaven spoke to Jesus. Jesus was crucified at the third hour. There were three hours of darkness while He hung on the cross. The Gifts: The first gift is Gold. Did you ever wonder why Jesus was born in a stable or cave? In ancient times gold was the gift given to kings, not to a baby of a poor, unknown couple. But here is where we must give credit to the Wise Men for their knowledge of scriptures. These men were not Jewish sages from the Temple at Jerusalem nor Biblical scholars from other parts of Judah. These men were from afar off, from a land given to false gods and idols. Yet, they appear on the scene from the distant East, fully knowledgeable of Jesus’ divine nature and then just as silently as they came, they depart from that scene and into, except for the record of scripture, obscurity. Gold. Gold is a standard by which the worth of everything else is judged. It is valuable in our day, just as it was in Jesus’ day but in that day it was understood to be the most valuable possession a person could own. We don’t know how much gold was given by the Wise Men, but any amount was probably very welcomed by Joseph and Mary to help with expenses in days to come. What is the spiritual significance of gold? Gold is the metal of Heaven. It is mentioned 22 times in the Book of Revelation. The streets of New Jerusalem are made of gold so thin it is transparent. (Rev. 21:21) . 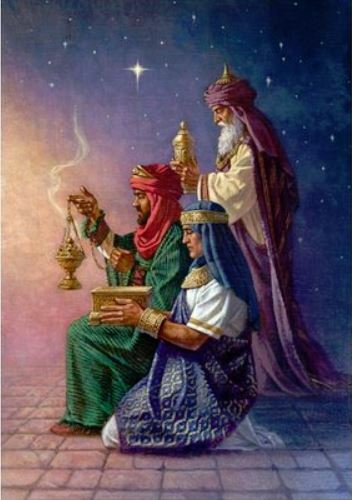 Gold was the gift for a King but frankincense was used to worship the King. If we could step back in time when the Temple at Jerusalem was still standing, we would find the chamber named the “holy place” filled with smoke from burning incense. Frankincense is a pleasant aroma you always remember. As a gift presented to Jesus it is a reminder that He is not only King of kings but He is our Great High Priest to represent us before God. He is fully qualified to represent us because He lived here on earth and experienced everything we go through in life. That’s why He can represent us in heaven. He has been one of us. Don’t ever think you have gone through, are going through, or will ever go through something that Jesus hasn’t already experienced. Someone might ask, “What about childbirth? Jesus was a Man. How could he have experienced the pain of having a baby?”. Of course, the obvious answer is He didn’t know the pain of childbirth but Jesus knew great physical pain. Think of the suffering He DID experience, the pulling of handfuls of hair from his beard, the whipping with leather thongs embedded with pieces of iron, the crown of thorns pressed into His head, the nails that were driven through His hands and feet. I can assure you, no one has ever known the physical pain, emotional pain, and spiritual pain, that Jesus endured and He did it all for you. In Jesus’ day, myrrh was a spice used to embalm the dead. Isn’t that a strange gift to bring a baby? What would you think if you were having a baby shower and someone brought a funeral wreath as a gift? You would probably wonder what kind of a twisted mind would do such a thing. Yet, the “Wise” men chose myrrh as one of the gifts to Jesus. Let’s consider the reason for each of the gifts. First, there was gold. Gold was given to Jesus in recognition of the King of kings and Lord of lords. Frankincense was given to Jesus as our Great High Priest. But myrrh was given for the sacrifice Jesus would make for us. The word, “myrrh” has its roots in the word, mara which means, bitter. Myrrh was also used as a narcotic to dull pain. There on that cross, instead of taking myrrh to numb the pain of the nails in his hands and feet, Jesus tasted death for you and me. You may be thinking by now that this is a depressing Christmas message, but let me explain a little more about this spice called myrrh. Do you remember the story of Queen Esther? (the Book of Esther) In that story, a wicked man named Haman plotted to kill all the Jews but Queen Esther, a Jewess, intervened. At the risk of her own death, Esther went before the king and was able to convince him that Haman was an evil man and by doing that she saved the Jews. But that’s just part of the story. Before she could see the King, Esther had to complete 12 months of beauty treatments which were required of every woman who went before the King. (Esther 2:12) There were six months of treatments with the oil of myrrh and six with other perfumes and cosmetics. Every day for six months Esther had to spend time in a room with burning myrrh and having oil of myrrh rubbed on her body. You see, myrrh prepared her to see the King. It’s the same for us. But for us, Myrrh represents a bitter experience. We needed the bitter experience of realizing we were sinners and lost without a Savior. Like Esther, we needed myrrh before we could meet the King of kings. Have you met the King yet? Actually, Christmas began in the Garden of Eden with a promise (Genesis 3:14) Later, the Promise was revealed with the birth of Jesus at Bethlehem. According to a plan established before the foundations of the world were laid, Jesus had to die on the cross so we could live forever in the presence of the King of kings. We accept that by faith and that, my friend is the true gift of Christmas.